Temper tantrums are a common part of a toddler's development. Normal tantrums are bad enough, but some children get so out of control they throw up. The sight of a toddler vomiting may worry parents, but it is not an unusual phenomenon and in most cases is not dangerous. Parents can learn how to deal with even the most dramatic temper tantrums and help their children learn more positive ways to deal with anger. Learn the difference between frustration and manipulation. Toddlers typically start throwing temper tantrums at around 18 months old because cognition has passed communication. They know what they want, but don't know how to express themselves. As parents give into the tantrums, children realize they are a way to control their environment and will throw temper tantrums deliberately. Learn your child's triggers. 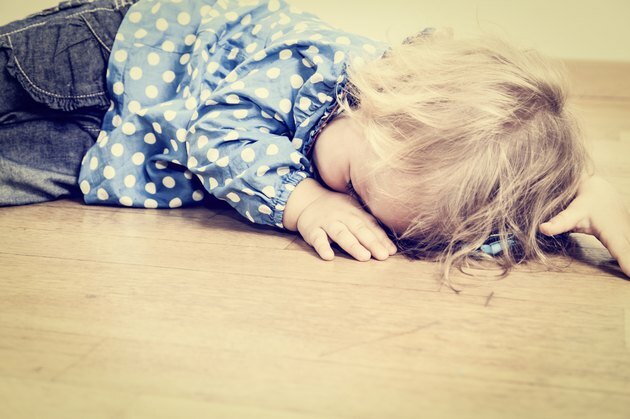 If a toddler always throws a tantrum under certain circumstance, you can be ready to defuse the situation. Recognize a building temper tantrum. Toddlers show growing signs of frustration and anger before a tantrum strikes. Intervening before the child gets out of control means stopping the situation before you have a toddler vomiting. Distract the child from the source of frustration. Children at this age have short attention spans and can't concentrate on more than one task. Directing the child's attention to a toy or a bird sitting on the window can circumvent a situation before it gets out of control. However distraction is not the same as reward. Defusing a tantrum by offering ice cream teaches the child the best way to get dessert is to act out. Be ready for the situation. Sometimes a temper tantrum builds despite intervention or because the parent is in another room. If you know your toddler vomits when emotions fly out of control, get a towel ready so at least you can minimize the stains on the carpet. Practice holding therapy. Young children are sometimes unable to calm themselves down immediately when tempers get too hot. A toddler vomiting may become even more upset by the action and start on an anxiety cycle. Hold the child in a relaxed embrace and speak in a calm, reassuring voice. Stay in this position until the outburst passes. Watch your own reaction. Parents must remain calm during a child's temper tantrum. Responding with anger or getting upset when the toddler vomits feeds into the energy and can make a tantrum worse. If necessary, take a few seconds to calm yourself first before dealing with the child. Tantrums are a normal part of development but strong tantrums which seem to come out of nowhere could indicate a problem such as autism. When a toddler vomits during a temper tantrum, erratic breathing makes it possible to inhale the vomit. If a child seems to have chest congestion after a vomiting episode, call your pediatrician.